Astronomers using the NASA/ESA Hubble Space Telescope, including scientists from the Universities of Warwick and Exeter in the UK, have seen dramatic changes in the upper atmosphere of a faraway planet. Just after a violent flare on its parent star bathed it in intense X-ray radiation, the planet’s atmosphere gave off a powerful burst of evaporation. Astronomer Alain Lecavelier des Etangs (CNRS-UPMC, France) and his team used Hubble to observe the atmosphere of exoplanet HD 189733b  during two periods in early 2010 and late 2011, as it was silhouetted against its parent star . While backlit in this way, the planet’s atmosphere imprints its chemical signature on the starlight, allowing astronomers to decode what is happening on scales that are too tiny to image directly. The observations were carried out in order to confirm what the team had previously seen once before in a different planetary system: the evaporation of an exoplanet’s atmosphere (heic0403). 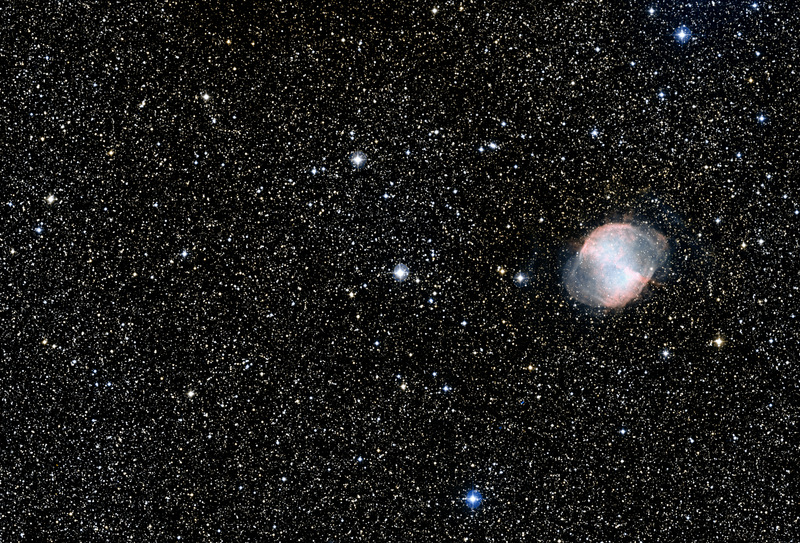 HD 189733b has a blue sky, but that’s where the similarities with Earth stop. The planet is a huge gas giant similar to Jupiter, but it lies extremely close to its star, just one thirtieth the distance Earth is from the Sun. Even though its star is slightly smaller and cooler than the Sun, this makes the planet’s climate exceptionally hot, at above 1000 degrees Celsius, and the upper atmosphere is battered by energetic extreme-ultraviolet and X-ray radiation. As such, it is an excellent candidate to study the effects of a star on a planetary atmosphere. The next question was: why the change? Despite the extreme temperature of the planet, the atmosphere is not hot enough to evaporate at the rate seen in 2011. Instead the evaporation is thought to be driven by the intense X-ray and extreme-ultraviolet radiation from the parent star, HD 189733A, which is about 20 times more powerful than that of our own Sun. Taking into account also that HD 189733b is a giant planet very close to its star, then it must suffer an X-ray dose 3 million times higher than the Earth. Evidence to support X-ray driven evaporation comes from simultaneous observations of HD 189733A with the Swift satellite , which, unlike Hubble, can observe the star’s atmosphere-frying X-rays. A few hours before Hubble observed the planet for the second time, Swift recorded a powerful flash of radiation coming from the surface of the star, in which the star briefly became 4 times brighter in X-rays. X-rays are energetic enough to heat the gas in the upper atmosphere to tens of thousands of degrees, hot enough to escape the gravitational pull of the giant planet. A similar process occurs, albeit less dramatically, when a space weather event such as a solar flare hits the Earth’s ionosphere, disrupting communications. While the team believes that the flash of X-rays is the most likely cause of the atmospheric changes they saw on HD 189733b, there are other possible explanations. For example, it may be that the baseline level of X-ray emission from the star increased between 2010 and 2011, in a seasonal process similar to the Sun’s 11-year sunspot cycle. Regardless of the details of exactly what happened to HD 189733b’s atmosphere, which the team hope to clarify using future observations with Hubble and ESA’s XMM-Newton X-ray space telescope, there is no question that the planet was hit by a stellar flare, and no question that the rate of evaporation of the planet’s atmosphere shot up. A. Lecavelier des Etangs (Institut d’astrophysique de Paris, CNRS, UPMC, France), V. Bourrier (Institut d'astrophysique de Paris, CNRS, UPMC, France), P. J. Wheatley (Department of Physics, University of Warwick, UK), H. Dupuy (Institut d’astrophysique de Paris, CNRS, UPMC, France), D. Ehrenreich (Institut de Planétologie et d’Astrophysique de Grenoble, UJF/CNRS, Grenoble, France), A. Vidal-Madjar (Institut d’astrophysique de Paris, CNRS, UPMC, France), G. Hébrard (Institut d’astrophysique de Paris, CNRS, UPMC, France), G. E. Ballester(Lunar and Planetary Laboratory, University of Arizona, USA), J.-M. Désert (Harvard-Smithsonian Center for Astrophysics, USA), R. Ferlet (Institut d’astrophysique de Paris, CNRS, UPMC, France) and D. K. Sing (Astrophysics Group, School of Physics, University of Exeter, UK). 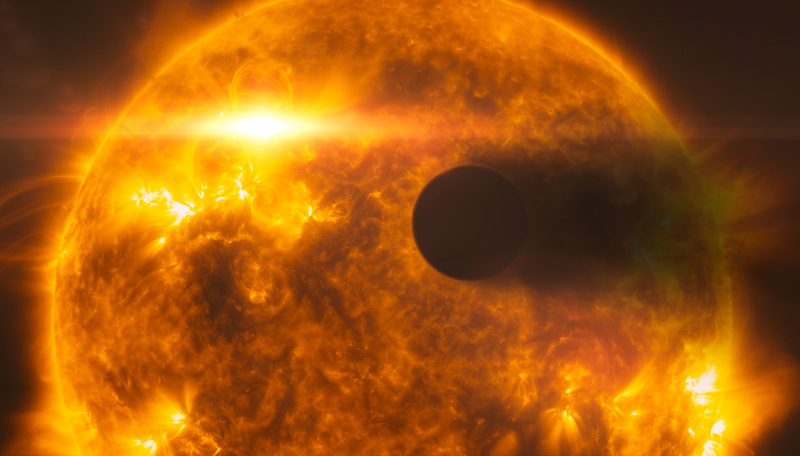 The study is presented in a paper entitled “Temporal variations in the evaporating atmosphere of the exoplanet HD189733b” which will be published in a forthcoming issue of Astronomy and Astrophysics. HD 189733b is a ‘hot Jupiter’ exoplanet orbiting the star HD 189733A, located around 60 light-years from Earth. Hot Jupiters are gas giant planets which orbit close to their parent stars. HD 189733b lies very close to its star, at only one thirtieth the distance between the Sun and the Earth, meaning it experiences temperatures of above 1000 degrees Celsius and orbits its parent star every 53 hours. It has around 10% more mass than Jupiter. Even Mercury, the closest planet to the Sun, is around 10 times further away. The planet has a hazy atmosphere made up primarily of hydrogen, which scatters short wavelengths of light, meaning it would appear blue. Its star, HD 189733A, is around 80% of the mass of the Sun, just over three quarters its diameter, around 800 degrees Celsius cooler and slightly redder in colour. It is part of a double star system with the star HD 189733B (not to be confused with the planet, HD 189733b), however this companion star is several thousand times further from HD 189733A, and much smaller than HD 189733A, and so has little or no effect on the planet. This method of observing exoplanets is known as the transit method, as it takes advantage of the planet transiting across the face of its parent star. Only a small fraction of exoplanets can be studied using the transit method, as it relies on the planet’s orbit being seen perfectly side-on from our perspective. However, for those planets where it is possible, observing transits is an extremely powerful tool. These observations were carried out using Hubble’s Space Telescope Imaging Spectrograph, an instrument which, much like a prism, splits light into its constituent colours. The relative brightnesses of different wavelengths of light carry a lot of information including the fingerprint of the types, properties, abundances and even motion of gases it has passed through. In this case, the team were looking for hydrogen gas (the predominant component of HD 189733b’s atmosphere) being blown off the atmosphere. The Swift satellite is an international mission bringing together NASA, the UK Science and Technology Facilities Council and the Italian Space Agency (ASI). Its primary purpose is detecting and studying gamma-ray bursts, but its X-ray and ultraviolet/optical telescopes are also used for other astronomical observations. Super Earths are a class of rocky exoplanets that are similar in composition to the Earth, but with a few times the mass. Super Earths within their stars’ habitable zones (where temperatures allow liquid water) are considered to be good candidates for life. Exoplanets Kepler-10b and CoRoT-7b are classed as super Earths, but are far too close to their stars to maintain liquid water. They are thought to be the rocky cores of planets similar to HD 189733b which have lost their entire atmospheres to evaporation.